In order to get herself in top form for the World Championships in July, Bethy has now started competing in the Cruiser category as well as her existing 20”. 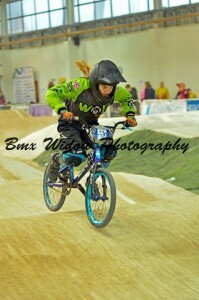 On Sunday at Manchester she finished 2nd, 3rd and 2nd in Age 15+ Supercruiser which meant she qualified for the A Final. This is the first time Bethy has reached the finals at Manchester so we were delighted especially since she had been racing on her 20” too and was exhausted. She didn’t even have chance to sit down between races before she had to head back up. She finished 6th in the A Final. On 20” in the Mixed Superclass and Female 15+ She finished 5th, 6th and 5th, considering she was racing the women that ride for the England squad we were really proud of her results.